President Trump has endorsed one of the Republicans, John Cox, which could give Mr. Cox enough votes to win the other slot. Given how overwhelmingly Democratic the state is — and Mr. Cox’s ties to Mr. Trump — that result would no doubt result in many people declaring Mr. Newsom the presumptive next governor. But if Antonio Villaraigosa, a Democrat and former mayor of Los Angeles, wins that second spot, look out for a competitive, classic North-South battle. • Polls close tonight at 8 p.m. California is a notoriously slow state when it comes to counting ballots, but we expect to get a reasonably early projection of the top finishers in the races for governor and Senate. • Candidates made a last-minute scramble for votes on Monday. In the governor’s race, Mr. Villaraigosa traveled around Los Angeles, ending up with a late-night stop at Pink’s Hot Dogs. Mr. Newsom greeted voters at a diner in Inglewood before heading to San Diego and San Francisco. Mr. Cox showed up at a candidate telephone bank in Riverside County. 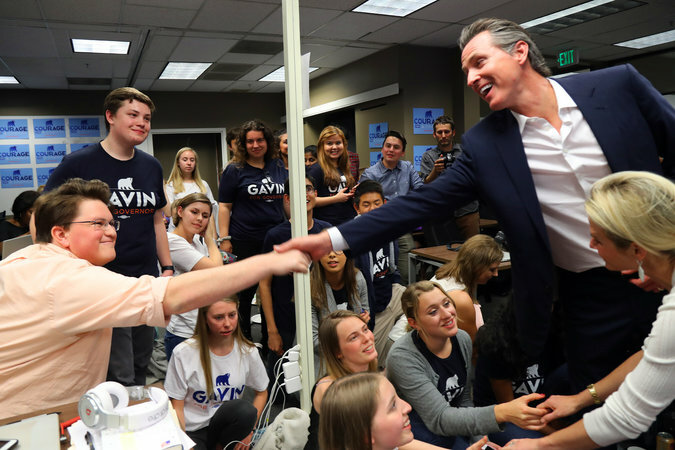 Gavin Newsom, right, a Democratic candidate for governor, and his wife, Jen Siebel Newsom, thanking the staff on Monday at his campaign headquarters in San Francisco. • Check out photographs from campaigns and primaries around the state. • Need a primer to understand the stakes of the races on Tuesday? Start here. And here’s an explanation of how the state’s unusual primary system works. • There were seven Republican districts that voted for Hillary Clinton in 2016. Will the Democrats be able to win those congressional seats? Here is a collection of charts that explore the data behind those key districts. • How will Latino voting power count in the primary? Here’s what we know. And will younger Asian-Americans help turn Orange County blue? Our reporter went home to find out. • We have 30 journalists throughout the state. This week, many of them will be on the ground reporting from the most competitive congressional districts, including races in the Central Valley, Orange County and San Diego. We will bring you live updates throughout the day on Tuesday. Follow them here and on Twitter. • Find your polling place through the secretary of state’s website, and check out the primary calendar for the rest of the midterms year. • Get the latest news on the state in your inbox by signing up for California Today here. 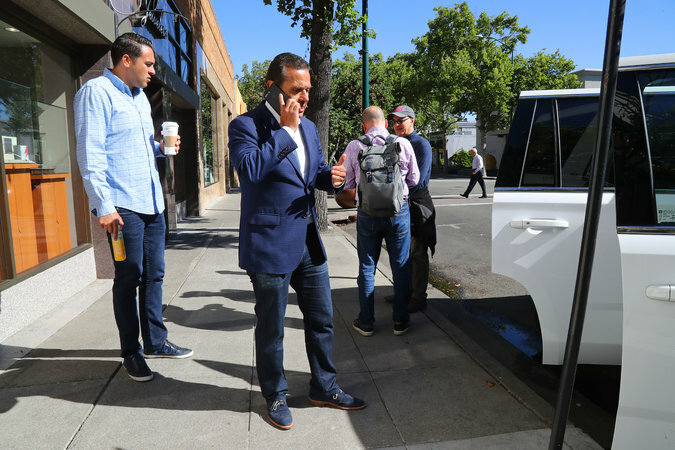 Antonio Villaraigosa, a Democrat running for governor, campaigned on Monday at a BART stop in Walnut Creek before stopping at Starbucks. Who will get the blame if Democrats get locked out? Today is Election Day, which means tomorrow is — depending on the results — Blame Day. The big question: If Democrats get locked out of competitive Republican-held congressional races — a distinct possibility in three districts because of California’s nonpartisan top-two election system — who gets the blame? The Democratic Congressional Campaign Committee, for lurching from candidate to candidate in some of these districts (until the end), giving voters little help in navigating ballots swimming with the names of mostly unknown Democrats who want to go to Washington. The California Democratic Party, for failing to groom a bench of candidates for this moment — and for its largely unsuccessful efforts to clear the field. California’s nonpartisan top–two election system. This election reform may end up producing the worst-case scenario Democratic and Republican leaders warned about when it was passed by voters in 2010. With so many candidates jumping into the open primary, Democrats are fighting over a set number of voters. 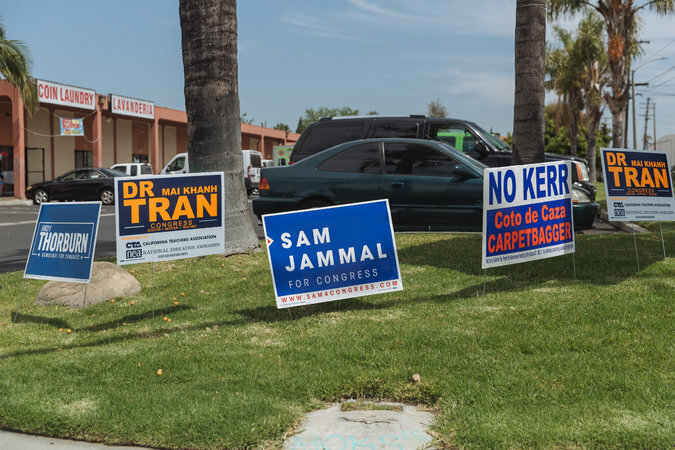 Candidate signs in Fullerton on Monday. California offers clues for the nation. The quirks that make the California primary risky for Democrats also make it a leading indicator of the general election. In California’s nonpartisan top-two system, voters can cast a ballot for any candidate, regardless of party. Historically, that means these top-two primaries look a lot like the general election. Since 1990, the major party vote share in top-two congressional primaries in Washington State and California has differed from the general election result by an average of three percentage points, an Upshot analysis shows. That mans the California results will be about as good as any data we are going to get before November. The average House poll over the final three weeks of an election is off by an average margin of 6.2 points, according to FiveThirtyEight. The primary results are a bit like getting a free round of 52 final House polls in early June. The results are good enough that you can put stock in a surprise. In 2016, Darrell Issa’s seat was rated “Safely Republican” by the Cook Political Report heading into the primary. But he ended up claiming just 50.8 percent of the vote, the closest House election of the cycle. Fluid political affiliations in the 21st District. Reporting from the 21st District in the Central Valley. That even families with different political views can agree is part of why Democrats hope they can turn this district from red to blue in November. On Monday afternoon, T.J. Cox, a Democratic candidate, visited with David and Dorothy Boldt, of D.E. Boldt Farms, at their ranch in the near-100-degree heat. Dorothy, a registered Republican, voted for Bernie Sanders for president in 2016, while her husband, David, a Democrat, said he held his nose and voted for Hillary Clinton. Both support Mr. Cox’s campaign. “I care about the whole laundry list of progressive issues, from climate change to a more friendly and open attitude to immigration,” Mr. Boldt said. Their son, Peter Boldt, 23, a registered Republican who also supports Mr. Cox, displayed an album of photos from their family’s farm, dating back five generations. As Mr. Cox sampled their plums, nectarines and peaches, David talked about how gentleness with the fruit is their specialty. 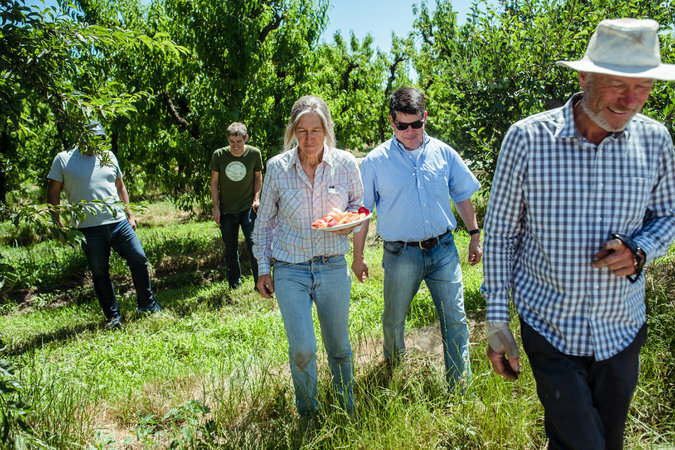 Some of their produce is on shelves in Whole Foods; little stickers on the fruit have the farm’s name on them. “I get emails from Wall Street brokers saying ‘I bit into one of your plums!’” David said. Mr. Cox peeled off a sticker and stuck it on his shirt like a campaign button. T.J. Cox, second from right, is a Democrat running to represent the 21st Congressional District. Dorothy Boldt, center, and her husband, David De Boldt, right, both support Mr. Cox even though she is a Republican and he is a Democrat. Previous article Is Electing More Veterans the Solution?